Christopher A. Derderian, M.D. is a native of Rhode Island. He earned both his B.A. in Biology and his medical degree at Boston University where he completed a combined undergraduate and medical school curriculum. During medical school, Dr. Derderian dedicated two additional years to scientific research including a fellowship with the Sarnoff Cardiovascular Research Foundation. After medical school, Dr. Derderian completed a combined residency in general surgery and plastic surgery at the Institute of Reconstructive Plastic Surgery at the New York University Medical Center. During his last year of residency he served as executive chief resident in plastic surgery. After completing his residency, Dr. Derderian continued his training with a one-year fellowship in Craniofacial Surgery at the Children’s Hospital of Philadelphia and the University of Pennsylvania. Dr. Derderian is board certified by the American Board of Plastic Surgery. Dr. Derderian moved to Dallas to join the faculty at University of Texas Southwestern Medical Center and Children’s Health℠ in 2011 as an assistant professor of plastic surgery. Dr. Derderian is a member of the cleft lip and palate team and craniofacial team at Children's Health Dallas. His areas of expertise include the treatment of craniosynostosis, cleft lip and palate, jaw surgery, rhinoplasty and ear reconstruction for microtia. Dr. Derderian holds office hours and operates at the Children's Health Dallas campus. The Children’s Health℠ cleft lip and palate team and craniofacial team offers comprehensive care for patients with cleft lip and palate and rare congenital deformities of the face and skull. Team care provides a dedicated group of specialists formally trained to care for patients with cleft and complex craniofacial problems. At yearly visits, families can see all ten of the specialists in a single visit. After the visit each patient is discussed in detail in the team care conference with each specialist providing his/her individual findings and care plan. Team care improves communication between the specialists and allows for coordination of any studies and/or procedures the patient may need in the upcoming year to make patient care more efficient. 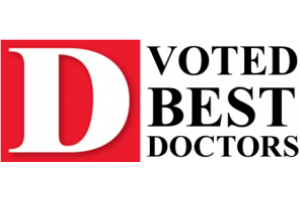 D Magazine has selected Dr. Derderian for its best doctors issue for several consecutive years. In addition to providing excellent clinical care, Dr. Derderian has published numerous book chapters and journal articles (view recent publications) to contribute to the evolution of craniofacial and cleft surgery. He has traveled both nationally and internationally to present his research in reconstructive and craniofacial surgery. He is a member of the American Society of Plastic Surgeons, the American Society of Craniofacial Surgery, the American Society of Maxillofacial Surgeons, the American Cleft Palate-Craniofacial Association, the Plastic Surgery Research Council, the Dallas County Medical Society and the Texas Medical Association. Dr. Derderian is married to Courtney Derderian, who is a pediatric anesthesiologist. They are residents of Dallas and have two daughters, Claire and Corinne. In his leisure time Dr. Derderian is a golfer and enjoys cycling.